Hello everyone, I have some extremely exciting news to share with you all! Now, you probably all already know what a huge fan I am of Asian beauty products. Sitting majorly pretty in the category of Asian beauty is Japanese beauty. The Japanese really know a thing or two about great skin, great makeup, and great products. 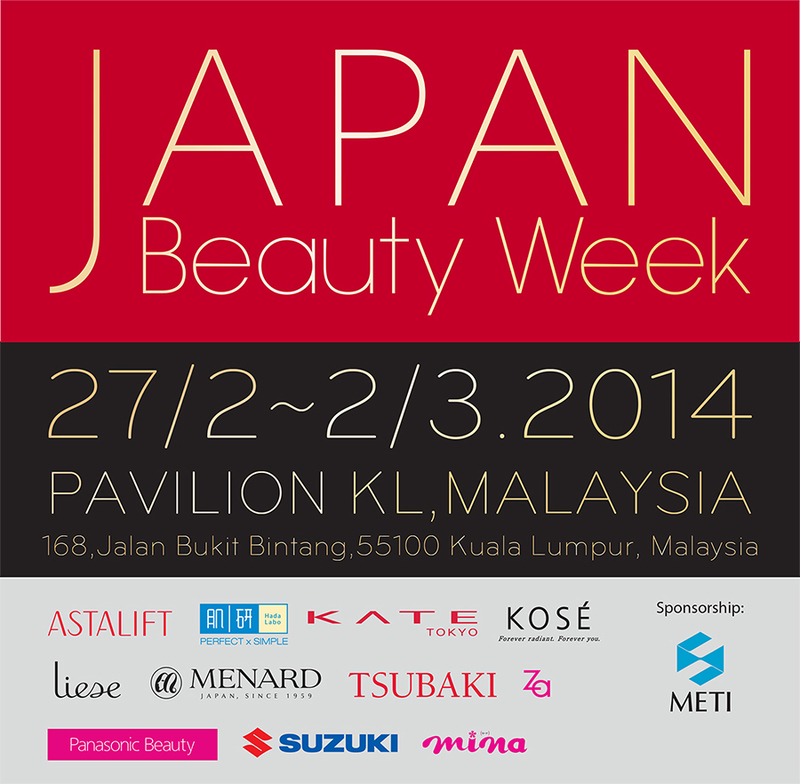 If you're looking for an introduction to some major Japanese beauty brands, or want to get better acquainted with brands that call Japan their home, head on over to Japan Beauty Week 2014, kick-starting on the 27th of February at Pavilion KL. KOSÉ - a makeup and skincare brand best known for their amazing brightening essence. Tsubaki - a haircare brand trusted and loved by many. Za - a world-renowned makeup brand. Hada Labo - a skincare brand famous for their hydrating lotion and their 'bouncy skin' ads! Astalift - a new player in the Japanese anti-ageing skincare market that has taken Britain by storm. Menard - a high-end skincare and cosmetics brand. Liese - a drugstore hair colour brand that revolutionised at-home hair colour, particularly for Asian hair. Panasonic Beauty - a line of at-home skincare and haircare appliances to keep you perfectly groomed no matter what the occasion. There will be tonnes to do at the event, including games and giveaways with fantastic beauty prizes to be won, makeup and skincare from world-famous Japanese brands on sale, free samples and vouchers, beauty lessons from international makeup gurus, skincare analysis, hair styling, and so much more. I will be a guest speaker at the event, and will share the stage with some brands during their demonstrations and talks! I will be speaking about the latest Japanese makeup trends and sharing my tips on how to achieve them! And Emily's Anthology followers who turn up to the event receive special treatment, and extra special goodies! So if you're interested in Japanese beauty and wouldn't mind getting free samples and fabulous hairdo's, come on over to Pavilion KL from the 27th of February to the 2nd of March (anytime between 12 and 9pm), and please do say hi if you see me, I would love to meet you all!